Alun Lewis was born on 1 July 1915 at Cwmaman, a mining village near Aberdare; both his parents were schoolteachers and his father later became the town’s Director of Education. The family took summer holidays at Penbryn in Cardiganshire, one of the poet’s favourite places. He was educated at Cowbridge Grammar School, the University College of Wales, Aberystwyth, where he read History, and at Manchester University. In 1938 he joined the staff of the Lewis Boys’ School, Pengam, enjoying a reputation as a gifted teacher, but in 1940, despite his pacifist convictions, resigned from the post and joined the Army as a commissioned officer. He found the life of the officers’ mess uncongenial, preferring the company of his men, most of whom were from the valleys of South Wales, but had time to resume the writing of poems and stories which he had begun while at school. In July 1941 he married Gweno Ellis, a teacher of German at Mountain Ash Grammar School. In the autumn of the following year his battalion of the South Wales Borderers was sent to India, where another period of intense literary activity began. The poverty and nihilism of India affected him deeply and he began to suffer bouts of the depression that had dogged him for several years. In January 1944 he went with his regiment to Chittagong in Burma. There, although an Intelligence Officer, he was given permission to move into a forward position facing the Japanese. On 5 March 1944 he was found shot in the head near the officers’ latrines; he died of his wounds six hours later. An Army court of inquiry concluded that his death was an accident, though the belief has persisted that he had taken his own life. 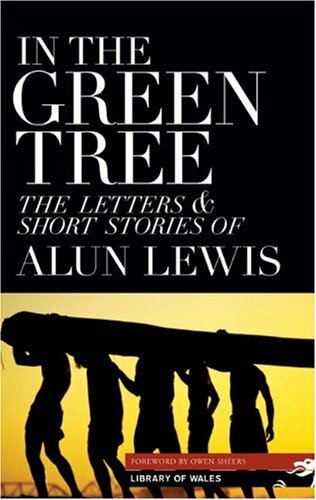 Despite his comparatively small output – he published only ninety-four poems and twenty-five stories – Alun Lewis was recognized as an accomplished writer during his own short lifetime. Serious, idealistic, devoted to those he loved, particularly his wife, and intent on serving humanity as a writer, he was primarily concerned with what he called ‘the twin themes of life and death’, exploring them in verse and prose of a high order. His stories appeared in The Last Inspection (1943) and the posthumous volume In the Green Tree. His two collections of poems are Raiders’ Dawn (1942) and Ha! Ha! Among the Trumpets (1945); his Collected Poems (ed. Cary Archard) appeared in 1994 and a selection in the Corgi series in 2003. In everything he wrote there is compassion for the underdog, whether British soldier or Indian peasant, and a fine delight in the natural world, even in the parched landscapes of the sub-continent. His was a tragic vision, forced to early maturity by his military experience, and his death at the age of 28 was undoubtedly the single greatest loss sustained by Welsh letters during the Second World War.